Returning home from the gym, I noticed there was a message on the answering machine. Although I listened carefully, it didn't make much sense and the Pres was no where to be found. When he came in he listened attentively to the recording as I saw him jotting down the details. When I began to ask questions, he immediately put this in front of me. Apparently, he had received a call from Nationwide Insurance that morning asking him if he was "Mr. So & So" and once he responded yes, he was told that there was a note in our mailbox from their client. The representative gave him a claim number along with other necessary information to submit the claim. Of course, this is what he saw BEFORE he got to the note! To tell you the truth, I was really really impressed that the driver even left a note. It's nice to know there are honest people around! this is truly a feel good story, I am happy to hear there are some left who do the right thing. Definitely a good person. 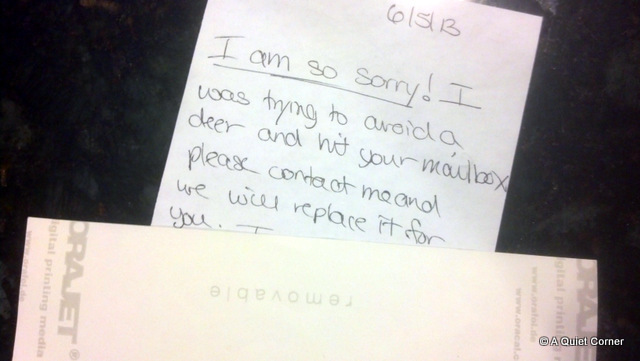 Not only did she leave a note, but she avoided hitting the deer. It's good karma, and like you I'm always glad and thankful when people are honest too!! That was very good of them! Yes it IS nice to know there are people still willing to take responsibility for their actions! 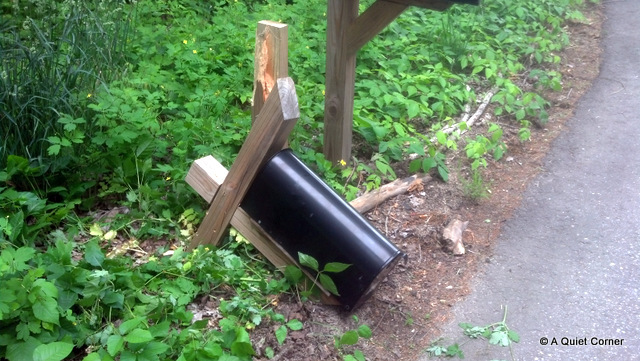 My first thought on seeing the mailbox would have been teenage vandalism. That's not qood to be so quick to judge, bad me.